Is Fury a War Movie? Long live macho-martyrdom and let’s kill as many bad, bad Nazi’s while we can. Yikes. 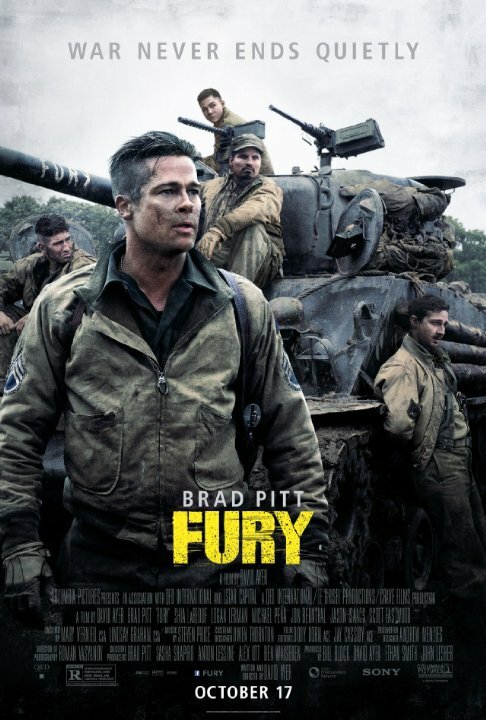 Fury is the kind of movie that gives the war movie genre a bad name. Bizarre is the word that came to my mind more than once while watching it. It was clear from the beginning that this isn’t an anti-war movie, but it took me until the end of the film to come to the conclusion that it’s not even a war movie. Just because someone pretends to tell us a WWII story doesn’t mean he really does. In my opinion, Fury is an action movie disguised as a war film. Plus, it’s full of clichés, not very realistic and the plot is dragging in the middle section. Did anyone else think of Platoon while watching this? We have a young, inexperienced soldier and an old, larger-than life hero who dies a rather spectacular death in the end. What’s with the Nazi killing? Maybe the Allies shot a few German prisoners but I doubt they forced their young soldiers to shoot them to harden them. They fall in love/lust awfully quickly in this film. While we’re not allowed to watch – we get to see a half-naked Brad Pitt aka Wardaddy. It’s been a long time since I’ve seen a movie in which the Germans were depicted as entirely evil and stupid. Shortly before the end, the young American soldier is hiding under a tank. A German soldier searches under that tank. He very obviously sees him but doesn’t shoot him. Or does he not see him? Both explanations are highly unrealistic. I’m really allergic to movies that try to glorify war or fetishize warfare. That doesn’t mean you shouldn’t watch Fury. Just keep in mind – it’s not an anti-war, possibly not even a war movie and far from realistic. Those who love tanks and Brad Pitt might enjoy it a lot.